This is Kali, and before you go searching about what kind of dog she is, I’ll just tell you this: She is a Nepali kukur– a Nepalese dog. What I mean by that is that her ancestors were never part of any kind of closed registry breed, but these village dogs were a source for all the breed diversity we have today. There is some debate as to whether this type represents the original dog. I tend to think the original type was more or less something like a laika or a laika with wolf ancestry. That’s because the bulk of the evidence suggests that dogs were domesticated before there were ever villages or agriculture. I think the village dog is the transition between the hunting wolfy spitz and the modern breed dogs. Dogs that became distinct from wolves were more like laikas, but as we came rely upon dogs less and less for protein and fur procurement, the village-type dog had a chance to evolve. We don’t know about Kali’s exact ancestry. We just know that she was rescued from a bad case of mange and emaciation. She was born in the Pashupatinath temple in Kathmandu, and when she was discovered, she was nearly hairless. She was taken to the Kathmandu Animal Treatment Centre (KAT Centre), where she was treated for her conditions. And she met her best friend, Simona Savoldelli. Simona is the one who rescued little Kali from the temple. And it is with Simona she now lives. Not in Nepal, but in the wilds of the Swiss Canton of Graubünden. Kali is proof that a dog doesn’t have to be of a specific breed to be exceedingly beautiful. 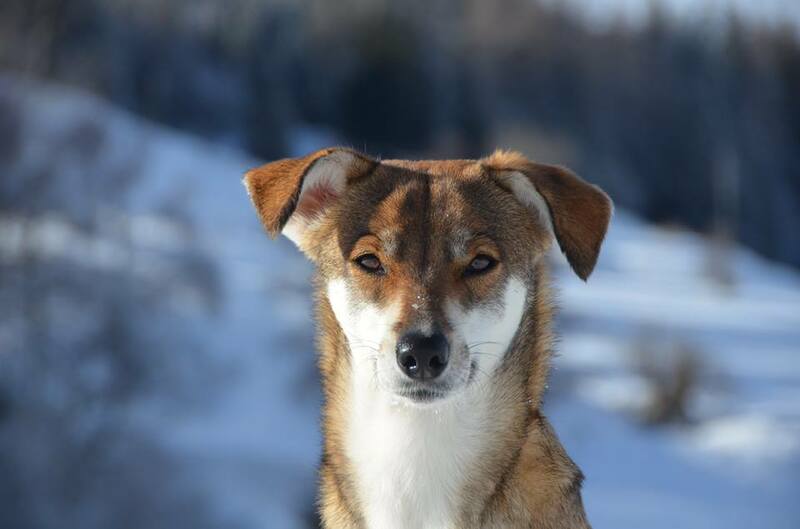 Svelte bodied with wolf-colored fur, expressive floppy ears, and brown eyes that reflect a sort of deep and noble intellect, Kali is having a wonderful life in Switzerland. She is a good dog, and you can tell from her owner’s video that she means the world to her. Yesterday was Kali’s third anniversary of arriving in Switzerland. With such diverse ancestry, Kali could easily experience another 15 anniversaries. She is a good dog who found the right person. Kali & Simona represent the very best of the canine/human bond. Thank you for this heart-warming story which made me cry tears of joy. I devote an entire chapter to the evolution of dogs in my book “Humans, Dogs, and Civilization” due out in all ebook platforms by the end of February. I cite cutting edge studies of DNA evidence showing that all dogs share a mutation that wolves don’t have, and the date of the mutation.is 5,000,000 years old, so dogs didn’t evolve directly from woves. Interesting post. Visit my blog for more on this fascinating study. Or it has since been lost in modern wolves. When the gorilla genome was sequenced, in some parts of the genome, humans and gorillas have the same genes, but chimps and bonobos don’t. However, when you look at the whole genome, humans and chimps and bonobos are much closer than to gorillas. We have a lot of genome-wide analysis now on dogs and wolves, and dogs and wolves are so close that it’s almost impossible to call them separate species and not bend one’s concept of a species into absurdity. The link in your name goes to a blank blog. Perhaps you could be so kind as to cite that study right here. Sure would be interested in seeing that citation here. Many years ago, while vacationing on Isla Mujeres off the Yucatan in Mexico, we met a German woman who lived there and she had this young female dog she wanted an American to take home with them. We were a soft-touch, and said yes. She arrived several weeks later, from 85+ degrees F through the airport in Minneapolis/St. Paul where is was below zero F. and finally into Spokane, WA where we anxiously picked her up. Her name was Colina, and she looked much like this dog. We had her till she was very old and finally died of old age. She was so sweet, had had distemper as a puppy, so had poor teeth, and we referred to her as our little Mexican thief, for she would obey us when told to leave some food out for the cats, but as soon as we left the room, she had quickly consumed it all. Her early life of starving never left her so her food anxiety was something we always had to watch her for. She was kind, sweet and a real sweetie. We said that she was tri-lingual, for she understood German, Spanish and English. Bless you, dear Colina!